Holmarc’s Contact angle meter Model no: HO-IAD-CAM-01A is an instrument for research as well as industrial application with motorized syringe pump for precise dispensing and with camera interface for measuring contact angle of liquids on solid. 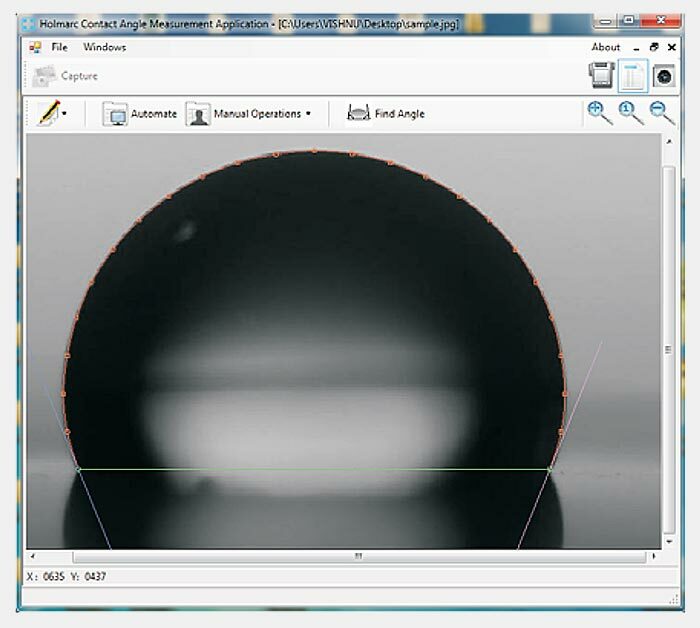 Video capturing and video image processing features are included in Holmarc Contact angle analysis software. The surface over which contact angle is to be measured can be rotated through +/- 180 degree from its horizontal position for advanced contact angle studies and to find out contact angle hysteresis. The wettability of a droplet is also dependent on the substrate in contact with the liquid. We provide three different substrates along with the equipment - made of aluminium, brass and stainless steel. However, the substrate according to customers’ choice can also be loaded into the equipment. The intensity of the backlight illumination, flow rate and volume dispensing can be controlled from the control panel. It is equipped with fuse for surge protection. The exhaust fan is also provided on the back panel with protection. Three chromatographic syringes with 50 micro litre, 100 micro litre and 250 micro litre capacity are supplied along with the equipment. Analysis method : Automatic curve fit analysis using drop snake method. Optics : High performance aberration corrected imaging lens with precise manual focus adjustment. Video system : High performance CMOS Sensor. 3m shielded USB cable included. Lighting : LED Based diffused lighting mechanism. Dispenser : Mechanical & Motorized dispenser. Other specifications : 30mm height adjustment for Sample holder. 360 degree rotation for the Sample Holder. 75mm XY Travel provided for the CMOS - Optics assembly. 1. Warm light LED with variable intensity control ensures extreme low heat radiation. 2. Precise travel adjustment provided for CMOS with Optics assembly to fine focus the image. 3. Manual and motorized syringe pump for precise micro liter dispensing. 4. 50, 100 & 250 micro liter sample syringes provided with the system. 5. Precision height adjustment and angular displacement provided at the test base. 6. Vibration inhibiting solid construction for sharp drop images. 7. Powerful and user friendly windows software provided for image analysis. 8. 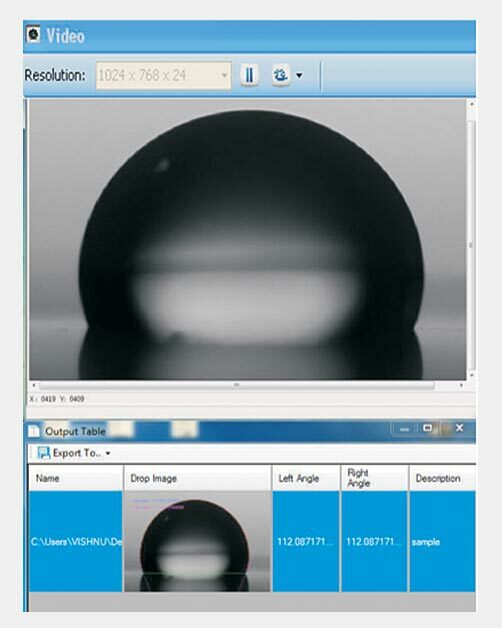 Live images can be viewed on the PC monitor showing the droplet on the solid surface reassures the operator - regarding validity of the contact angle measurement. 9. Substrate can be rotated +/-180 degree from horizontal position. 10. 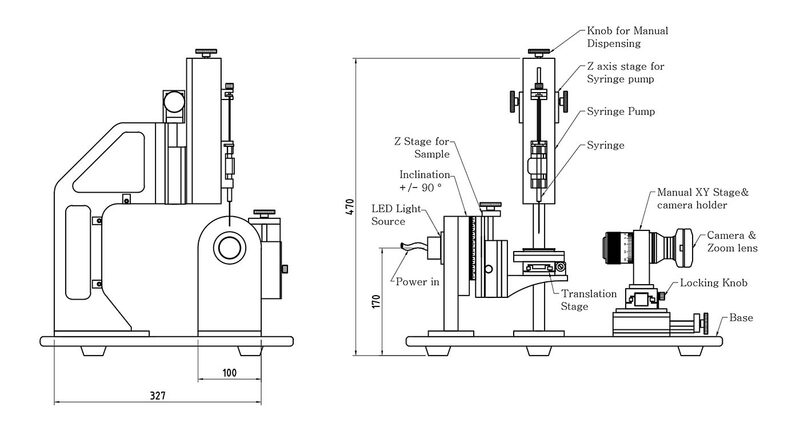 Captured image and its Angle measurement table can be saved for future reference. Contact angle is the angle formed by a liquid at the phase boundary where a liquid, gas and solid intersect. The shape of the drop is controlled by the three forces of interfacial tension. Static Angle and Advancing Angle are quantitative measures of the wetting of a solid by the liquid, but they can also be used as a quality control measure in surface treatments and surface cleanliness. Receding Angle is a quantitative measure of the adhesion of a solid to a liquid. 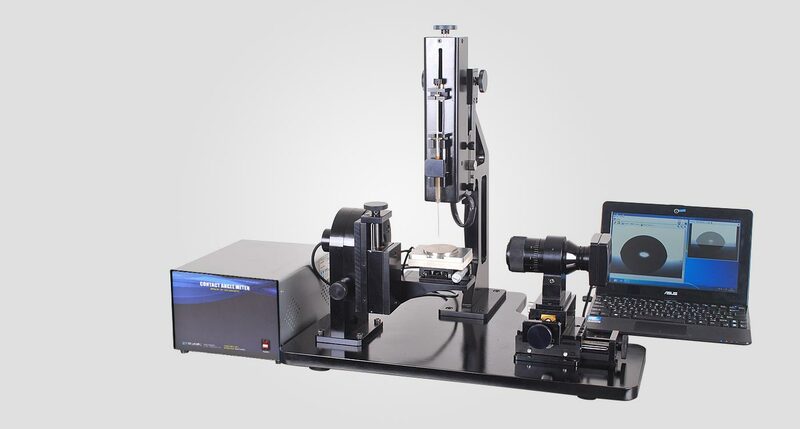 State-of-the-art optics, precise opto-mechanics, high-resolution CMOS detector and associated electronics used in our instrument guarantee error free measurements. Manual and automatic dosing of liquids can be done using our system. Standard off the shelf syringes can be integrated from 0.4 to 20 ml, from any manufacturer. Compatible with glass, plastic and SS syringes.